Looking for ideas and instruction on the multitude of ceramic decorating tools out there. The Decorating Tools section of Ceramic Arts Daily is the right place to be. Here we’ve gathered articles and information on the tools used in decorating ceramic work from potters of all level of experience. You’ll find out how they use store-bought, found or even handmade ceramic decorating tools to make their work their own. And don’t forget to download your free copy of the Ceramic Decorating Tool Techniques: How To Use Clay Pencils, Slip Trailers, Glaze Pens, and Carving Tools. This handy studio reference includes valuable technical references and great clay tools to help you with forming, surface decoration and firing. One of the best things about clay is its ability to take on texture. From handmade to storebought, from clay texture rollers to traditional stamps, we have pottery texture tools covered in our archives. 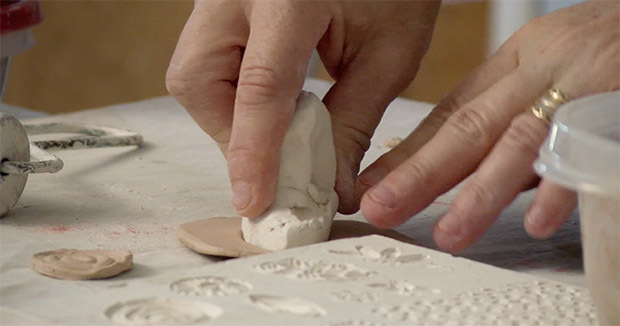 You’ll also find different ways to make your own clay stamps using everything from polymer clay to plaster. Clay can also be cut, carved, slashed, and scratched for decoration. If you’re looking for advice on the best clay carving tools, you’ll find lots of articles detailing the tools and pottery carving techniques. You’ll also discover innovative techniques for making your own carving tools or adapting the carving tools you already own to be more ergonomic. Love sgraffito? We have several articles on how to make your own sgraffito tools and advice on perfecting the technique! And, of course, there are multiple ways to get imagery onto clay, using everything from brushes to screen printing to slip trailing. We’ve got those ceramic decorating tools covered in these pages too! No matter where your interests lie, you’re sure to find something interesting and educational on ceramic decorating tools on Ceramic Arts Daily. So jump in and explore!